Welcome to The Secret Restaurant. Sit anywhere you’d like. Each week I’ll be using whatever’s fresh and in season at the local Farmers’ Markets to create recipes. The focus might be an ingredient, a technique, a piece of equipment, or an event (in a few weeks I’ll be putting up recipes for a Mother’s Day feast). Despite some short stints in professional kitchens, I’m basically an accomplished home chef. In a restaurant kitchen, speed and consistency are paramount. Make every dish quickly and make it the same. These are good skills to master and have made me a better cook, but, for me, the real pleasure of cooking is being able to take the time to explore and fiddle, letting the ingredients lead me where they will. Some of my recipes will be simple—something you could put together on the fly for dinner on a weeknight, and some will be more ambitious and will take some planning and time. I hope we’ll be able to have a conversation about food and see where that takes us. 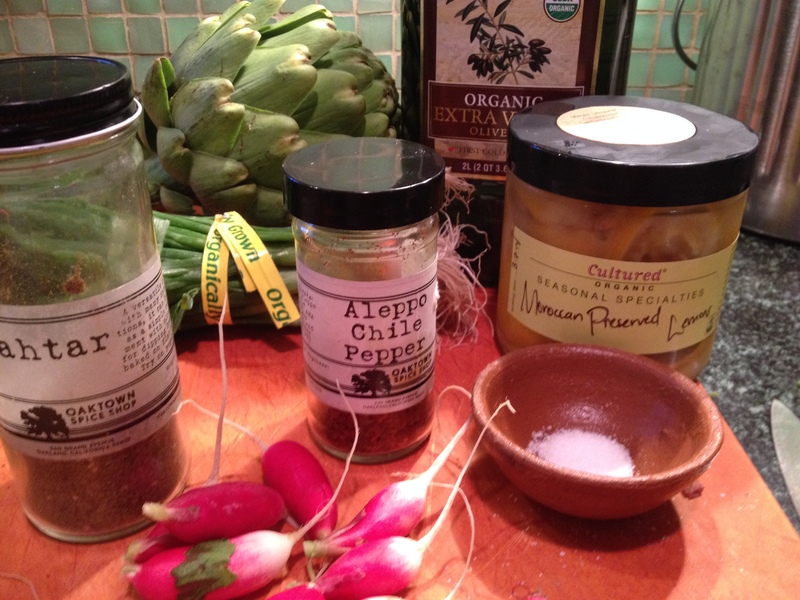 So yesterday I saw some beautiful artichokes at the Berkeley Farmers’ Market and decided to go with a roasted artichoke recipe. 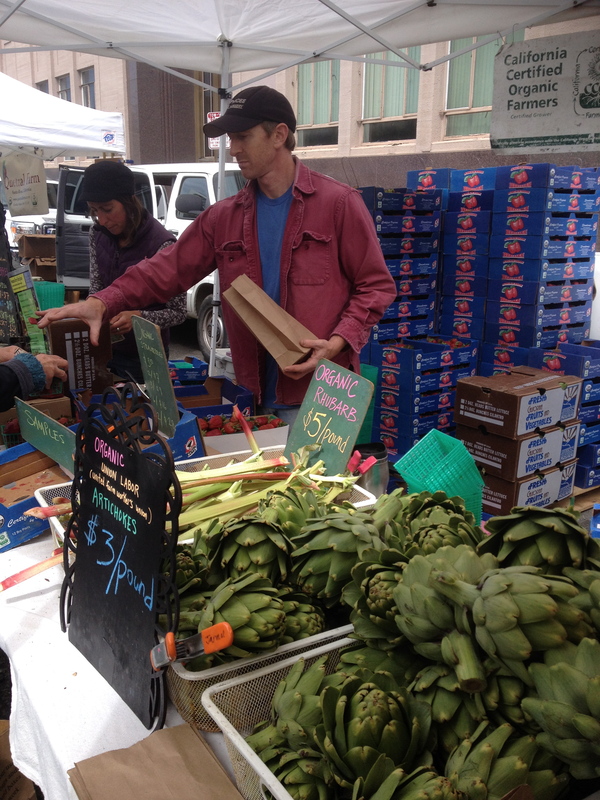 The artichokes were from Swanton Berry Farm in Davenport near Santa Cruz. I made this with chicken thighs but it will work well as a vegetarian/vegan dish without. Just add another artichoke or another protein—tofu works well. Put the olive oil and spices in a large bowl and mix well. Prepare the artichokes. Start by cutting the top off about an inch or so above the choke. 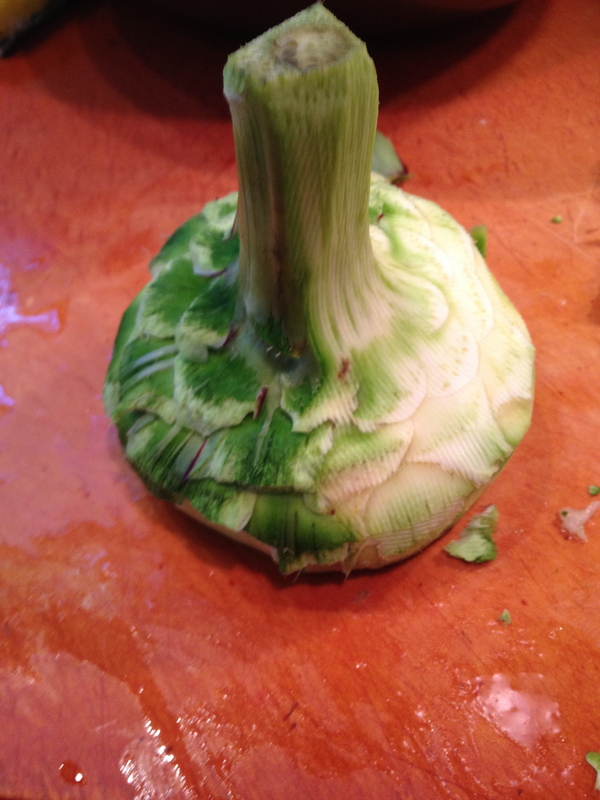 Cut the artichoke into quarters and cut out the choke with a knife and cut again into eighths. Add to bowl with olive oil and spices. Add radishes, scallions and chicken (if using) and toss to coat. Put on a sheet pan lined with parchment paper and roast for 25 minutes. A simple green salad should be enough to accompany this as a weeknight meal. I’ll usually take a heart of romaine and tear it into pieces, pour on a bunch of olive oil and a tiny, tiny bit of balsamic vinegar, add salt and pepper, and you’re done. The beauty of this recipe is that there are endless variations. 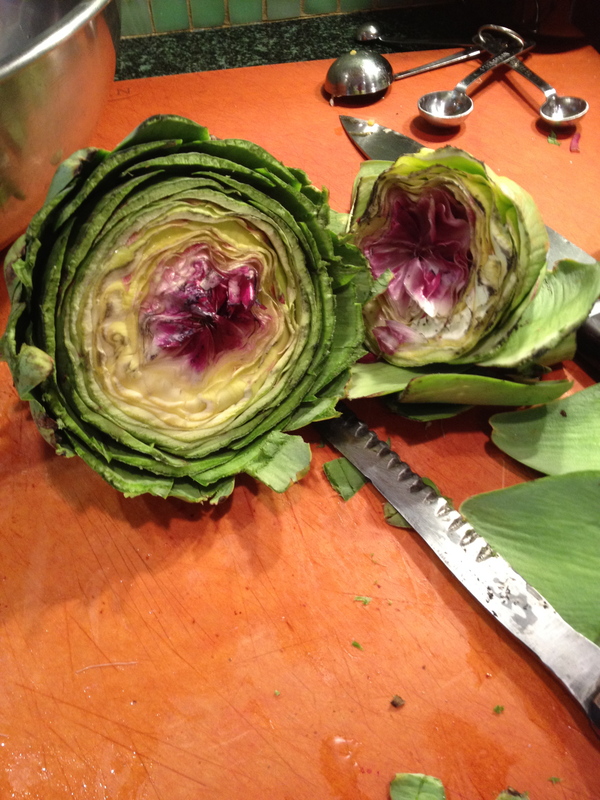 Instead of artichokes you can roast broccoli, cauliflower, or Brussel sprouts. Use spring onions or shallots in place of the radishes or scallions, change the spice mix, or add some cashews or almonds. The timing stays pretty much the same—25 minutes at 425°. 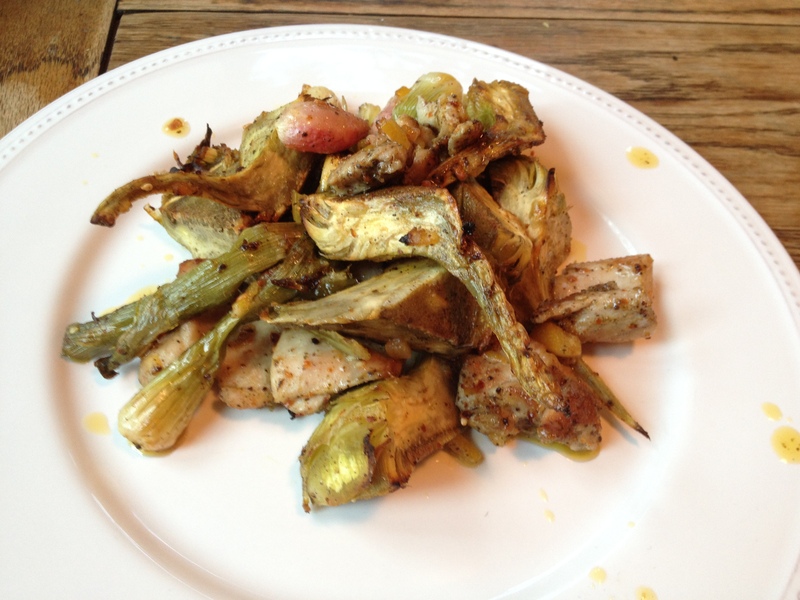 This entry was posted in Eat and tagged artichoke, Eat, recipe, The Secret Restaurant. Bookmark the permalink.